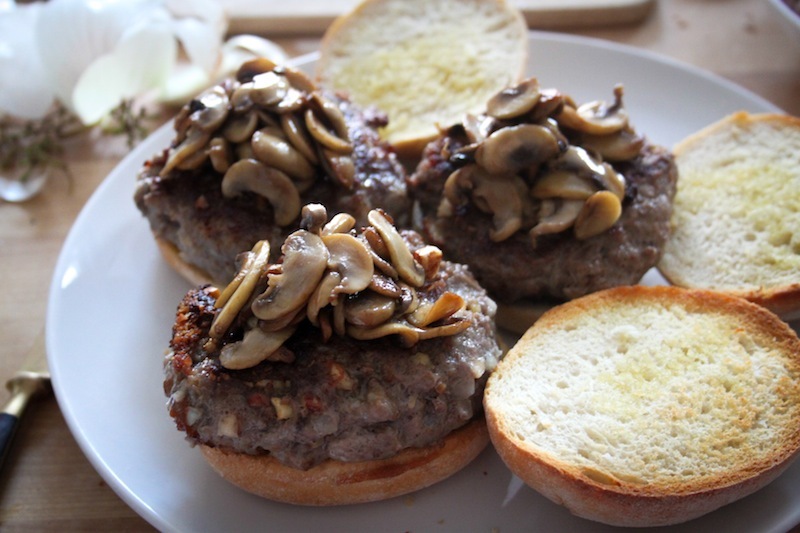 The Element of Surprise: Moroccan-Style Burgers with Apple-Balsamic Reduction – Eat Me. Drink Me. 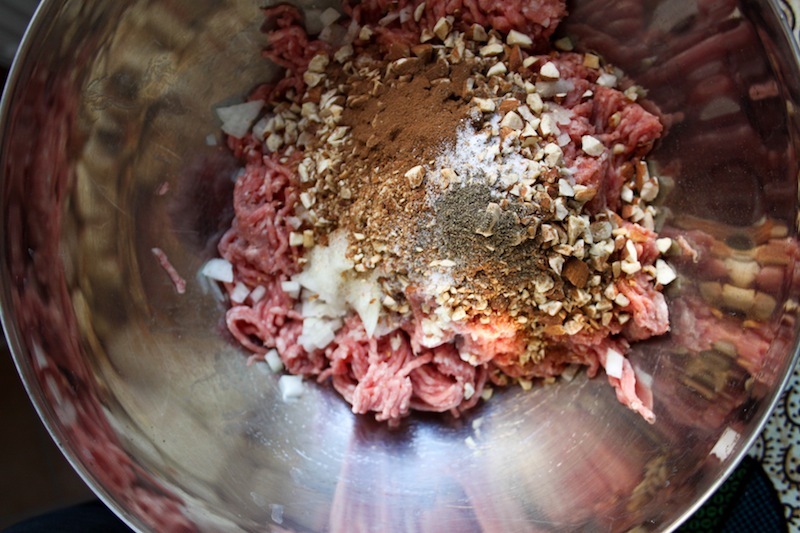 I don’t think my thought process at the time was as rational as all that, but adding the cinnamon to the burger mash felt right, even though my brain was surprised at quickness of my hand’s action. And those burgers, when they were finally done – the cinnamon was everything. Like cymbals in a grand orchestral march, they highlighted just the right notes. 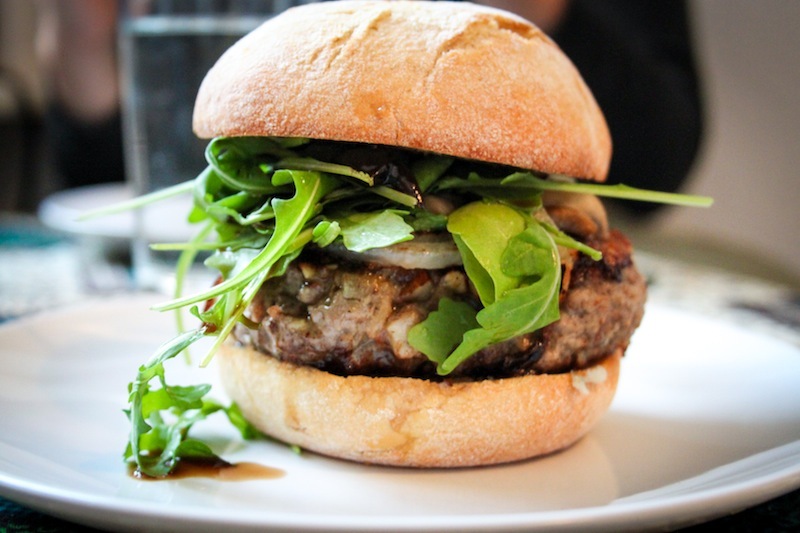 A sweet, dark chime against umami-rich mushrooms caramelized in olive oil, slightly charred sweet onions, bitter mixed greens, potent gorgonzola and everything that is in and of itself awesome about a burger. There are some surprises, however, that are less fortuitous. Like the call from your health insurance company informing you that they don’t know if they consider your previous employment valid, that they may want you to “cover the difference.” Or the moment you slide open the cabinet door beneath the sink to find a growth of mold clinging to the plaster wall. Or waking up to find half your bedroom wallpaper wilting towards the ground, damp concrete beneath. There have been a lot of surprises in my life lately. But what I’m trying to remember is that a surprise isn’t a dead end, it’s a re-route sign. Things break, plans change, insurance companies screw you over – and we keep going. We buy anti-fungal spray and hope that a coat of white paint will hide the spot when the time comes to turn over the apartment. We sigh and save and say, it’s only money. We wake up at 7 am to let the workmen in and say, at least I’ll get some emailing done. We add the cinnamon and wait to see what happens. 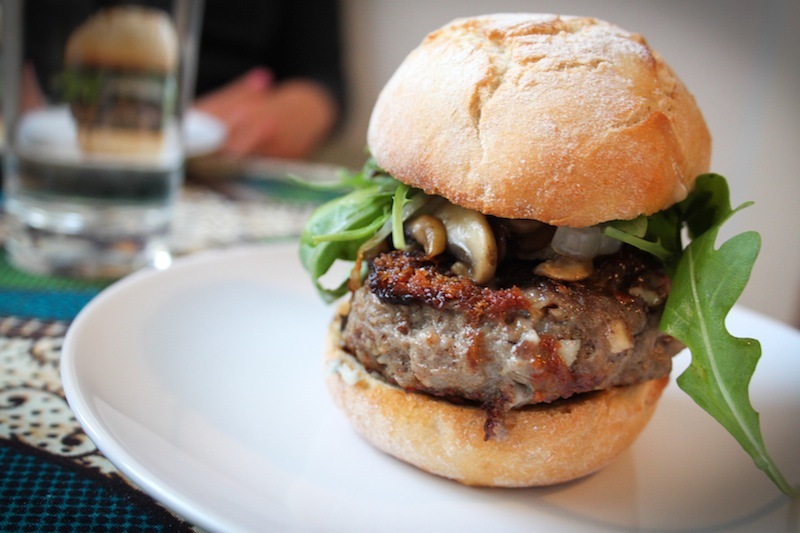 This recipe makes about 7 good-sized burgers. 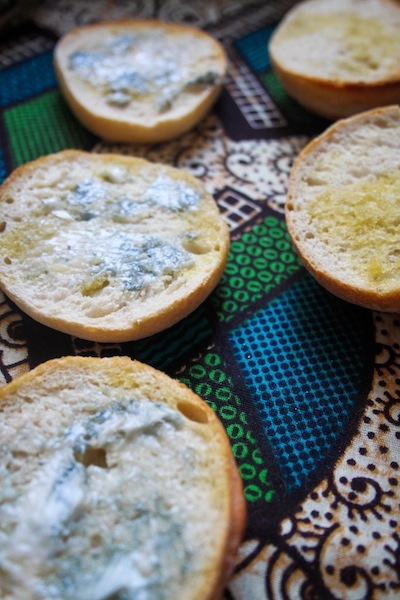 Feel free to substitute blue cheese for gorgonzola and/or to experiment with other bitter mixed greens besides arugula. 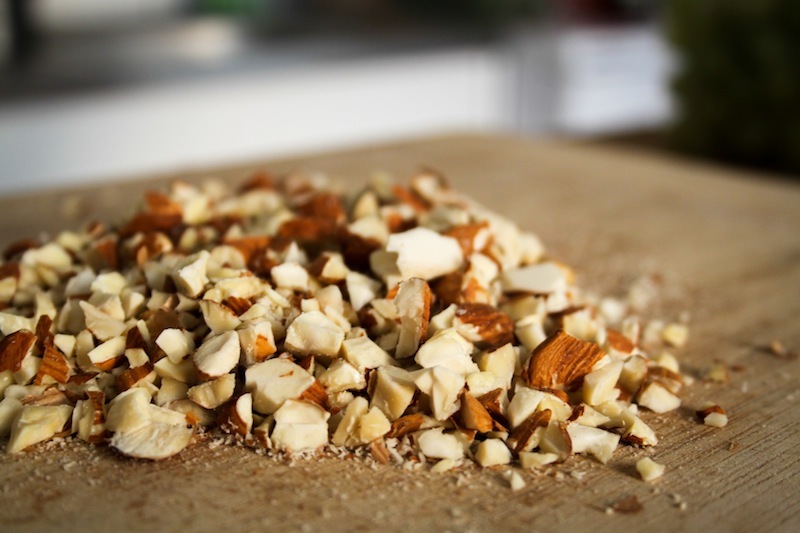 Chop almonds until they’re a pebbly blend between coarse chunks and fine powder. 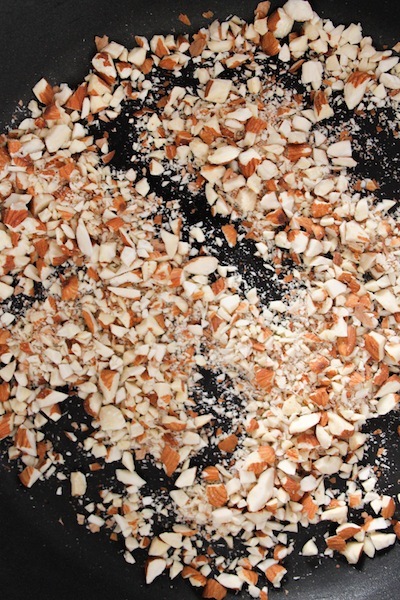 Briefly toast them in a hot, dry skillet until they start to brown, but don’t blacken. 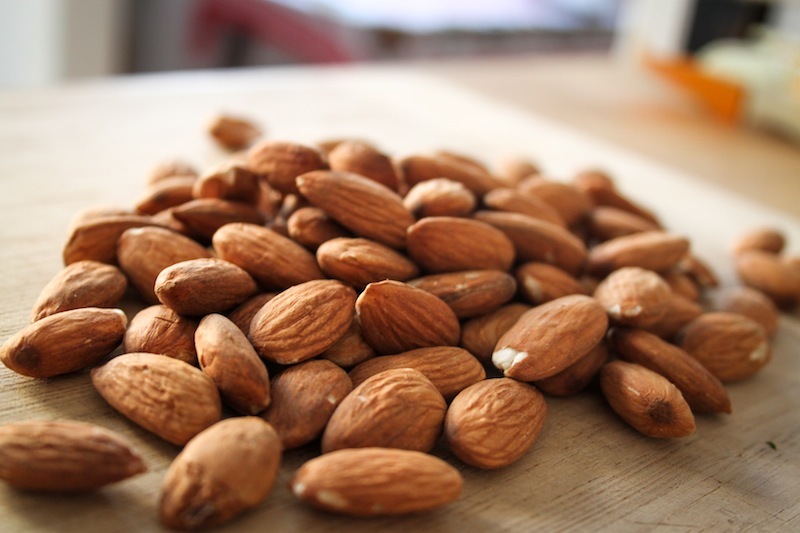 Toasting nuts burn quickly, so don’t take your eyes off them. 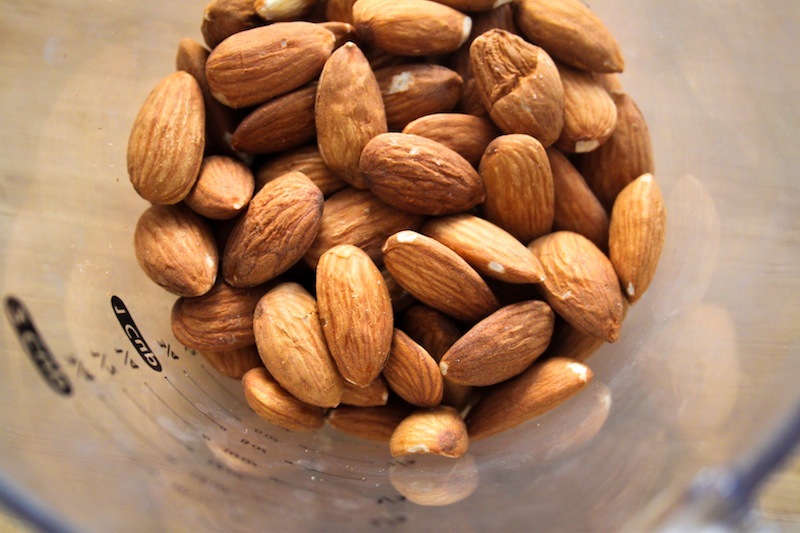 Mix almonds with ground beef, onion, garlic, gorgonzola, cinnamon, salt, pepper and chili flakes until all ingredients have been completely blended. 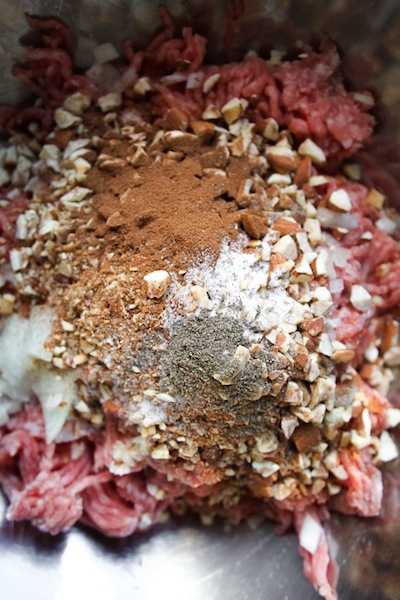 Shape into patties and set aside. Heat apple juice and balsamic vinegar in a saucepan over high heat. Chop grapes and add. Keep the mixture at a boil, skimming any foam from the top until the liquid has reduced to about 1/3 cup. 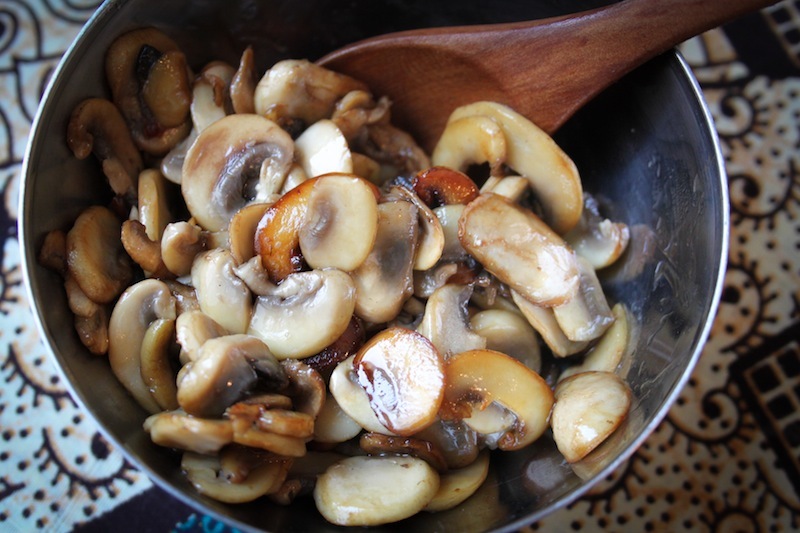 In the meantime, lightly sauté mushrooms in olive oil until they turn golden and slightly caramelized. Season with salt. Set aside. 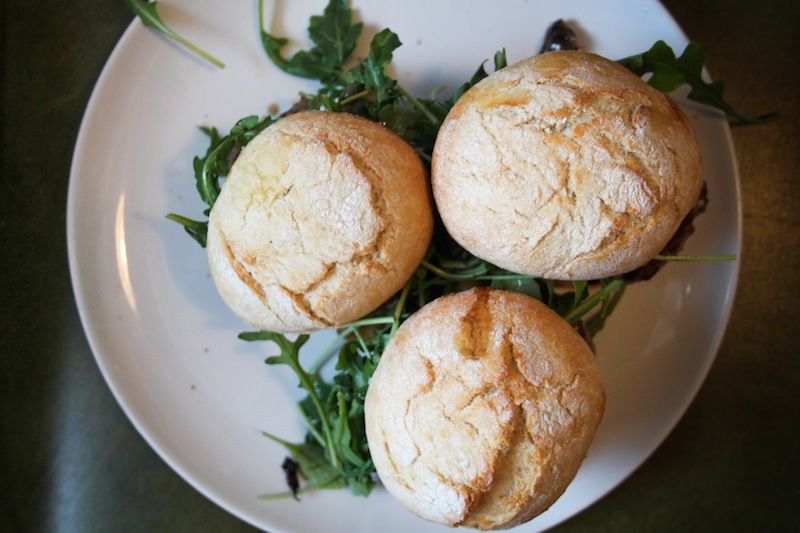 Slice open buns or rolls and rub the surface with a bit of olive oil. Place under the broiler and broil until just toasted. Remove from the oven and lightly rub the toasted side of the bottom half with a cut garlic clove. Spread just a bit of gorgonzola on the top half of the bun. 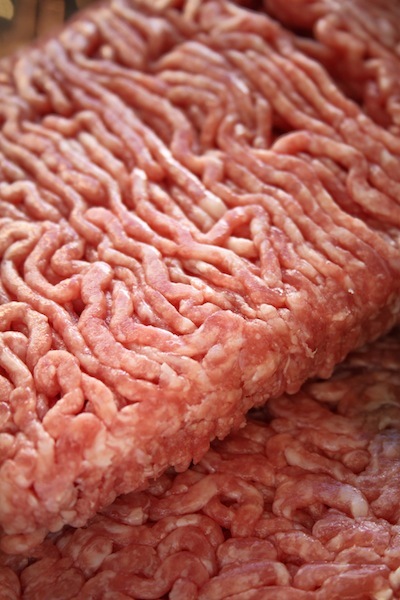 Cook burgers in a skillet, or on a grill, if you’re lucky enough to have one. 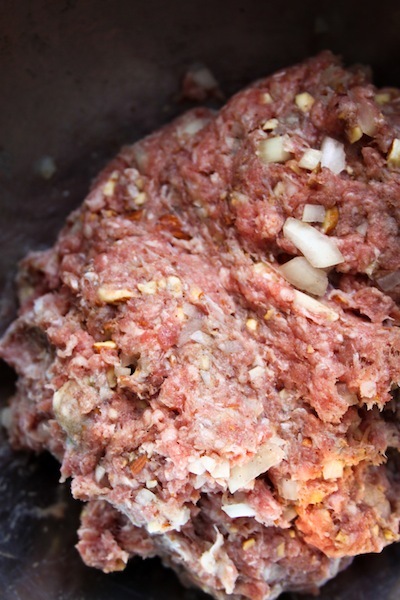 If you’re cooking burgers in the skillet, toss the slices of onion into the burger grease for a quick wilt before adding them to the burgers. 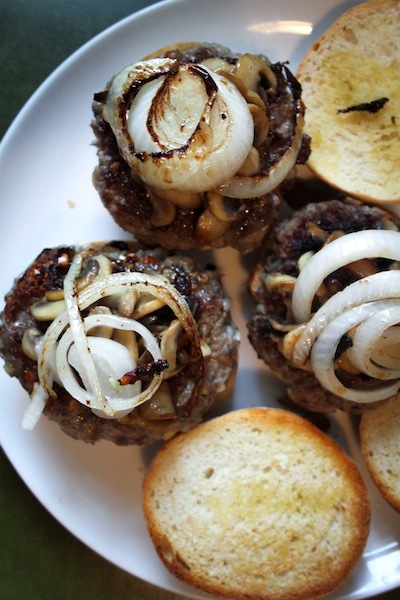 If you’re cooking on a grill, the onions can go on at the same time as the burger. 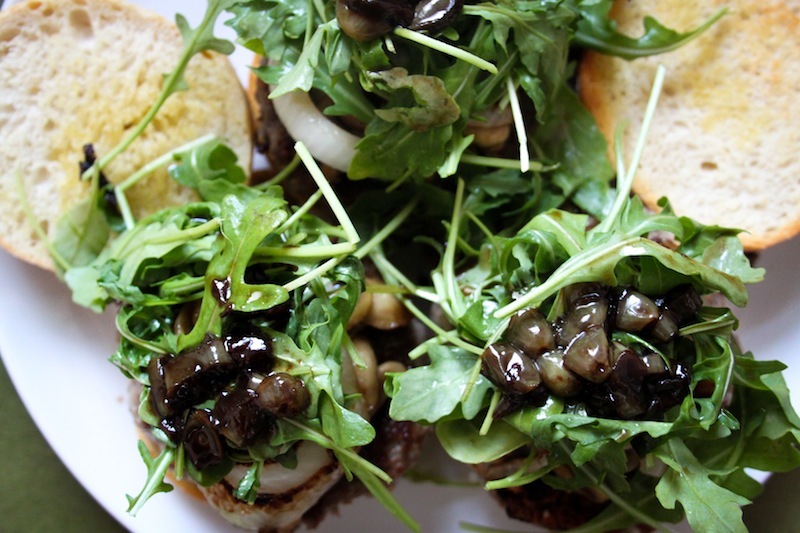 When the burgers have cooked to the done-ness of your choice, begin assembly: Bun, burger, mushrooms, onion, arugula, reduction.